Ovidrel® (choriogonadotropin alfa) is a highly purified form of recombinant human chorionic gonadotropin (r-HCG). It is indicated for the induction of final follicle maturity and early luteinization in infertile women who have been pretreated with FSH medications as part of an assisted reproductive technology program (ART). It is also indicated for the ovulation and pregnancy in an ovulatory infertile patients in whom the cause of infertility is functional and not due to primary ovarian failure. The premixed, prefilled syringe contains 250 mcg of r-hCG in a 0.5cc solution. 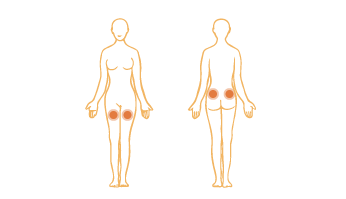 Ovidrel is administered as a subcutaneous injection. Ovidrel is used to induce ovulation (the release of an egg/eggs from the ovary) after patient monitoring indicates that sufficient follicle(s) growth has occurred. Side effects that may occur include: abdominal pain, ovarian enlargement, nausea, vomiting, and injection site reactions (site pain, bruising, inflammation). The risk of ovarian hyperstimulation syndrome (OHSS) should be discussed with your physician prior to treatment. Early warning signs include severe pelvic pain or bloating in the stomach, severe stomachache, nausea, vomiting and weight gain. If you experience an allergic reaction: difficulty breathing; closing of your throat; swelling of your lips, tongue or face; or hives; seek emergency medical attention immediately. 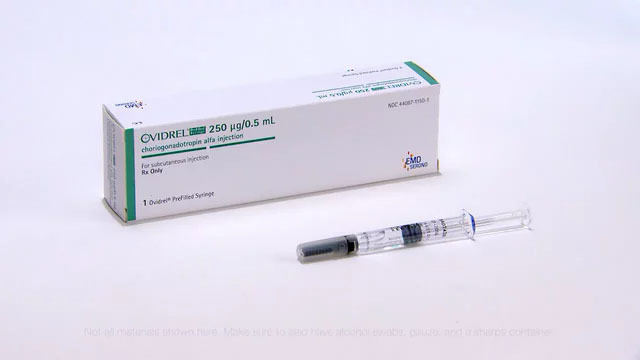 Store Ovidrel PreFilled Syringe at room temperature for up to 30 days or refrigerate until expiration date.